Author(s) Kantarjian, Hagop M.; Wolff, Robert A. 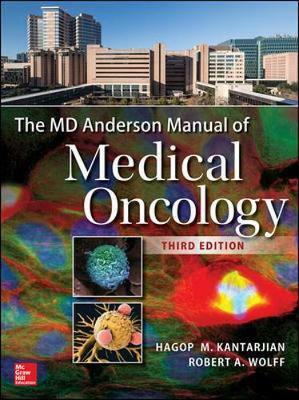 The MD Anderson Manual of Medical Oncology details the personalized multidisciplinary approach to cancer management and treatment of common and rare cancers pioneered by The University of Texas MD Anderson Cancer Center. Its pragmatic presentation can provide valuable insights at any stage of your career. This completely updated third edition reflects the most recent advancements, including expanded coverage of the rapidly evolving area of biological and immune therapies of cancer, many developed at MD Anderson. It emphasizes and discusses continuing developments in diagnostic procedures, which include the incorporation of new molecular markers and revised staging systems. It also reinforces how imaging and molecular profiling can prevent administration of overly aggressive, toxic treatment regimens or invasive surgery to treat superficial or indolent tumors. To help you quickly assess cancer management options, every chapter includes numerous tables, diagrams, imaging photographs, and prescriptive advice. Evidence-based treatment algorithms in the form of flowcharts and diagrams shaped by the clinical experience of MD Anderson’s world-class faculty enhance the text.